I know it's been a fortnight since I posted anything on this space. But the last few days has been extremely hectic, tiring and sickening all at the same time. First there was this nasty flu that Purvi contracted. My poor daughter suffered with incessant coughs for almost a week. I had a tough time nursing her back to health. By the time she was better, I feel sick with the flu and it had me bed ridden for almost two days. Although the fever subsided, the coughing and sneezing persisted for almost ten days. By the end of these ten days, I felt like my tongue had turned to lead and had lost all sense of taste and smell. I desperately needed something to perk up my taste buds. 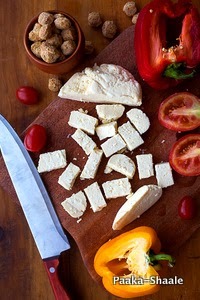 I rummaged my refrigerator and found this small piece Paneer and halved red and yellow bell peppers. I knew there was some Soya chunks some where in the Pantry. So I decided to put everything together to make this crowd pleasing curry. The best thing about this curry is that, it can be prepared with any combination of vegetables and still manage to taste great. You can either prepare this curry with just vegetables or with only paneer or with mushrooms or baby corn. You see, the possibilities are endless. 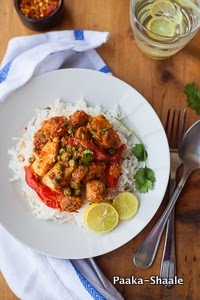 And anyone will fall in love with this versatile curry. All it takes is just 30min of your time and voila!! You'll have a brilliant side dish to dig into. This recipe was given to me by a kind hearted chef of restaurant in Dar. 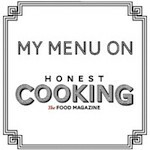 I remember memorizing the recipe after he had told me. From then on, this curry has appeared on our dining table from time to time. 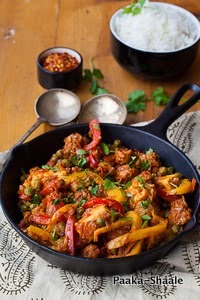 Jalfrezi is my go to dish whenever I have unexpected guests or whenever I need to dig into something rich and comforting. No matter what the reason is, the curry has never disappointed me. 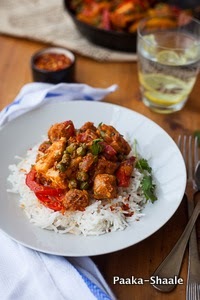 So here's my version of Jalfrezi. Red and yellow bell peppers- 1/2 cup, cut into strips. To prepare the soya chunks, Soak the the chunks in 3 cups of warm water for 10-12min. Squeeze the soya chunks thoroughly, retain the chunks and discard the water. Heat ghee in a non stick pan. Add the paneer cubes and fry till golden brown, remove from ghee and set aside. Add the capsicum strips to the same ghee and fry till tender. Remove and set aside. Add oil to the same pan. Add the cumin seeds and allow them to sputter. Stir in the pureed tomatoes, turmeric powder, red chili powder, salt, sugar, coriander seed powder and Aamchur powder and fry till the gravy thickens. Add the tomato ketchup and fry for 2-3 min more. Add the soaked soya chunks, paneer cubes and garam masala and mix well. Add the fried bell pepper strips and mix gently. Allow the curry to cook for 2-3 mins more before taking off the heat. Garnish with coriander leaves and Serve hot with rice or rotis. 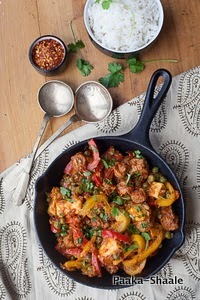 Thats a mindblowing and very innovative combination.. Am in love with this terrific Jalfrezi cant resist to it. Its a nice & wonderful dish. I have tried and made a delicious Soya Manchurian dish. Please check the video and prepare it in your home.